Links to personal pages and more information on our individual research, study animals, personal peeves, and other interesting facts are on the main menu bar. Our current interns have their own page. We also have a hall of fame for postdocs, students, and lab interns and volunteers. This page has group photos (somewhat randomly) from over the years, including some noteable visitors. 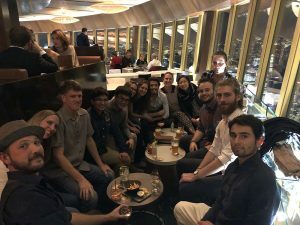 Lab social at the 360 Lounge at the top of the Sydney Tower, May 2018. Great view! 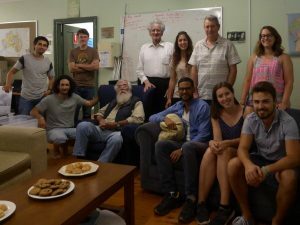 Eric Pianka was invited to Australia by the Australian Herpetological Society and visited the lab in 2017. 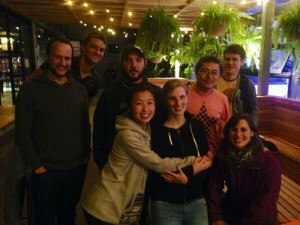 A slightly fuzzy view of some of the lab in May 2015 at Sarah Deventer’s farewell! 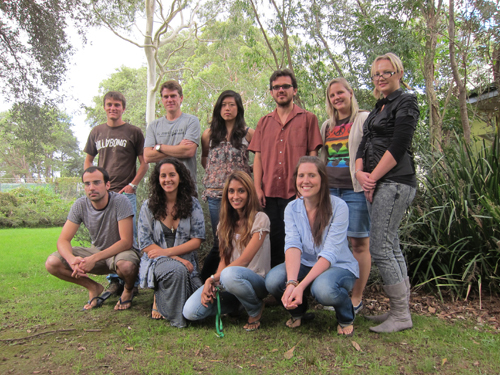 Left to right: Stephan Leu, Dan Noble, James Baxter-Gilbert, Fonti Karr, Sarah Deventer, Feng Xu, Martin Whiting, Julia Riley. Missing: Jodie Gruber, Susie Hewlett, Patricio Lagos, Arnaud Badiane. 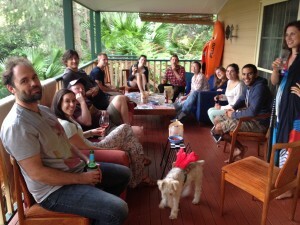 Christmas party at Umina Beach 2014. Rom Whitaker (4th from left) visits the lab! December 2014. 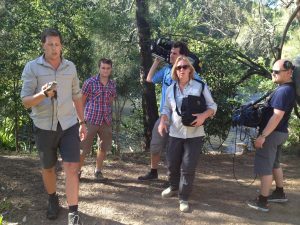 Freek Vonk, a Dutch documentary maker and scientist visited the lab in February 2014 to film toads and water dragons. Freek Vonk and Dan Noble setting up a water dragon shot, February 2014. The Lizard Lab in November 2012. Left: Martin Whiting. 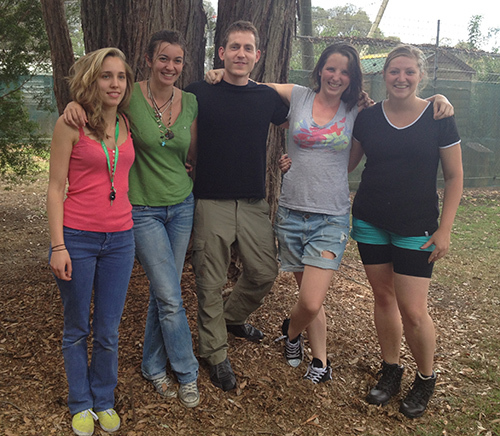 L-R back row: Eléonor Germain, Dan Noble, Julie Pauwels, Katharina Hinz. L-R front row: Nathalie Lallemand De Driesen, Renata Kopena, Aljoscha (Josh) Kubassa, Dani Chandrasoma, Marco Barquero. Missing on the day: Alana Mailey, Grant Webster, Siobhan Dennison, Ben Clark, Patricio Lagos. The lab in April 2011. 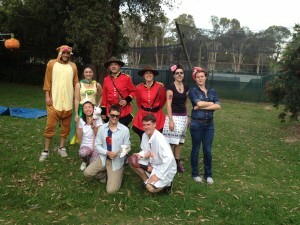 L-R rear: Dan Noble, Martin Whiting, Yee Wah Lau, Marco Barquero, Kerrie Wechmann, Alana Mailey. L-R front: Pau Carazo, Suead Zumut, Dani Chandrasoma, Siobhan Dennison. 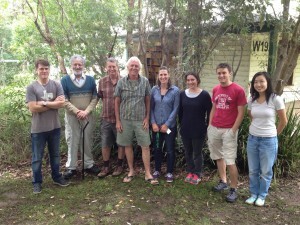 December 2011 at the conclusion of Qi Yin’s visit to the Lizard Lab. Nicolas Butruille, Qi Yin, Marco Barquero, Dan Noble, Moniek Poppe. 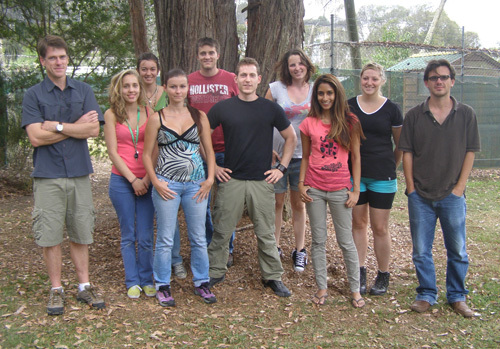 Lizard Lab interns in December 2012. L-R: Nathalie Lallemand De Driesen, Eléonor Germain, Aljoscha (Josh) Kubassa, Julie Pauwels, Katharina Hinz. Missing: Stephanie Muenchau. 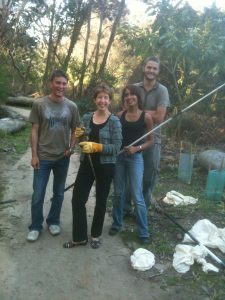 Marlene Zuk visited the lab in 2010 (and many other labs) on her way to ISBE and helped us catch some water dragons! 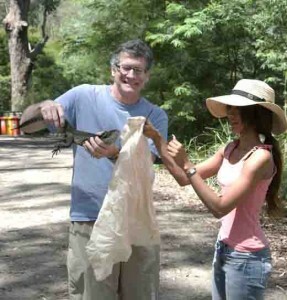 In 2010 Jonathan Losos visited the lab and of course, helped us snag some water dragons.